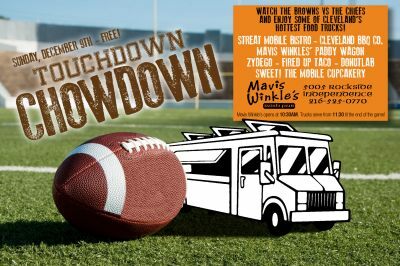 On December 9th, the Browns face off against the Kansas City Chiefs and Cleveland’s popular food trucks will be lined up outside Mavis Winkle’s serving up an eclectic offering of tacos, barbeque, Cajun inspired dishes, desserts and other unique gourmet comfort foods. Mavis Winkle’s, located at 5005 Rockside Road in Independence, Ohio will provide a warm place for football and food truck fans alike to watch the game and enjoy their food and drinks specials. The trucks participating are: Mavis Winkle’s Paddy Wagon, StrEAT Mobile Bistro, Fired Up Taco, Zydeco Bistro, The Cleveland BBQ Company, DonutLabCleveland and Sweet! The Mobile Cupcakery. The event is family friendly and admission is free. Mavis Winkle's will be open for full bar service at 10:30 am and trucks will begin serving at 11:30 a.m. Food and bar service will continue through the end of the game. The food trucks will be charging their regular prices for their offerings, with drink specials to be announced by Mavis Winkles before the event. Guests can RSVP their attendance on Facebook to receive a wristband that entitles them to VIP specials throughout the event. Just search for “Touchdown Chowdown Cleveland” or go to: https://www.facebook.com/events/451846371540284/ for more information.